This hybrid perennial foxglove originated in 1926. A winning hybrid of pink D. purpurea and yellow D. grandiflora ‘Summer King’ has ample spires of crushed strawberry red flowers, a neat, compact form and handsome foliage. It blooms early summer and is lovely with apricot calendulas and lavender larkspurs in humus rich, well-drained soils. Depth: Surface sow and press in lightly; requires light to germinate. Starting Indoors: 8-10 weeks before last frost, surface sow in preferred growing media. Keep at 60-65°F by placing in a warm, sunny location or under grow lights, as these seeds require light to germinate in about 2-4 weeks. Secure containers with plastic covering to retain moisture removing covering as seeds germinate. Keep moist, but do not allow soil to be saturated, as this can cause fungal problems such as damping off. Remove to a cooler bright location once germinated. Thin about 1-2 weeks after germination. Plants can be hardened off by placing in a sheltered area outdoors for about a week prior to planting in the ground. Flowers first year. Starting Outdoors: After last spring frost, surface sow in a location with full sun. Part shade is best in hot summer locales. Will bloom the following year. Foxgloves are enchanting woodland’s edge flowers where they shine against greenery, and impressive exclamation points in flower filled June borders. Deer avoid it, bees love it and if cut when just opening they last well in bouquets. 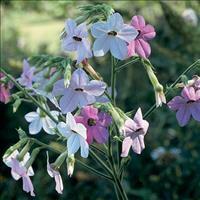 This circa 1925 hybrid perennial is a tetraploid, and has larger flowers and better foliage than either parent. Deadhead after flowering, but allow some to self-sow, as strawberry foxgloves are short-lived perennials. Avoid locations that are wet in the winter. Watering Details: Water regularly—1” per week, more during particularly dry spells. Soil pH: Acidic to mildly alkaline. Fertilizer: Mix about 2” of compost or well-rotted manure into the soil at time of planting, and top-dress every spring with about 1”; scratch in. Diseases & Pests: Slugs can be troublesome. Prevent damage by sprinkling iron phosphate pellets on the ground around the plants during favorable conditions for slugs. Avoid powdery mildew and leaf spot with proper spacing in a location that has good air circulation. Plant: Clumping evergreen rosettes of green, lance-to-ovate shaped velvety leaves, with the largest leaves at the bottom, decreasing in size moving up the flower stalks. Leaves vary in size but can reach 6-8” long and 2” in width. Entire plant is 3-4’ tall and 1-2’ wide. Remove any winter-damaged leaves in spring. Flowering: Spires of pendulous rosy-colored flowers 2-3” long, arising from the vegetative clumps; somewhat bell-to-funnel-shaped. Seeds: Flowers turn into brown capsules containing tiny brown seeds. Self-sows. The genus name Digitalis comes from the Latin digitus, meaning finger, in reference the flower shape; their appearance is similar to that of the tips of a glove.